This is just one of many things that can go wrong with diabetes on any given day. Add to this that I’m going on and doing things that any normal person would deem risky, dangerous or downright crazy! One of the reasons I was jumping into that helicopter that morning was for training for the Lesotho Ultra Trail, a 50km ultra Sky Marathon. In just two weeks I’d have to be ready to defeat the odds betting against me. Skyrunning is defined as running in the mountains above 2,000m altitude where the climbing difficulty does not exceed II° grade and the incline is over 30%. https://www.skyrunning.com . 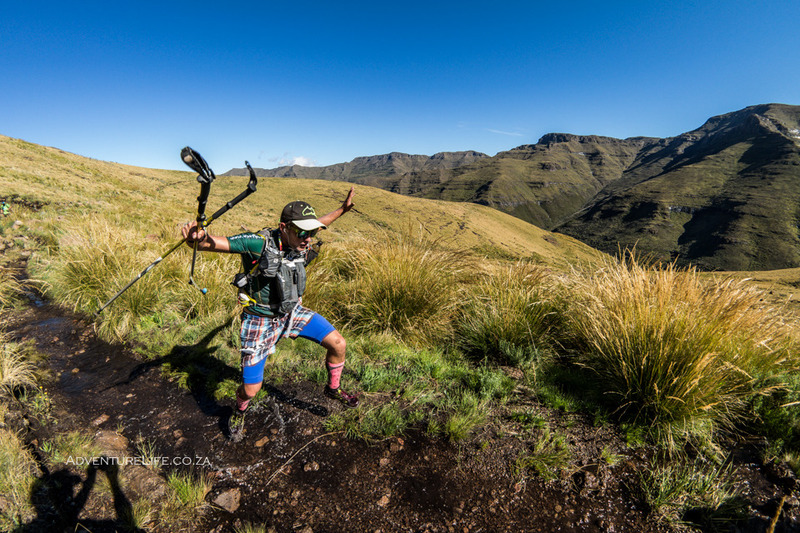 I’m no average weekend warrior, I’ve completed 2 cape epics, many cycling races, been adventure racing for years and organise my own 6 day mountain bike stage race in Lesotho called the Lesotho Sky. I had never even entered a trail run before, let alone an Ultra Sky Marathon. It’s a little embarrassing lining up at the start line with some of the best athletes from around South Africa and needing to ask where to put my race number… this fortunately was one of my only issues. I know how to suffer, and I know how to fight myself after spending countless hours in the mountains. This along with many years of practice with my blood sugar management puts the odds back in my favour. In the start chute, I position myself with the people I presume will be of similar pace, based purely on physique which is pretty difficult as all 136 starters are lean as ostrich fillet and look like they could run for days. The plan was a simple one, run your own race, your own pace and finish. I had nothing to prove and no rivals to beat as I had never done any trail run before. Last minute sugar check: 9 mmol (perfect for the start), and I was off. A crucial element to success at this event was and always will be what you eat along the way. I packed crunchies, droewors, cheese, mixed nuts, a banana, an apple, some dried fruit, 2 jungle bars, a peanut butter and Nutella sarmie and 2 GUs in case of emergency. The key is eating consistently, keeping my blood sugar from dipping to dangerous levels and maintaining the performance I needed to complete the challenge. The first 20 km went like breeze, crushing the first monster climb, making friends on route, and taking a few shots for my social media and Instagram along the way. Things were dandy until I got to the one part of the route that I was really looking forward to. 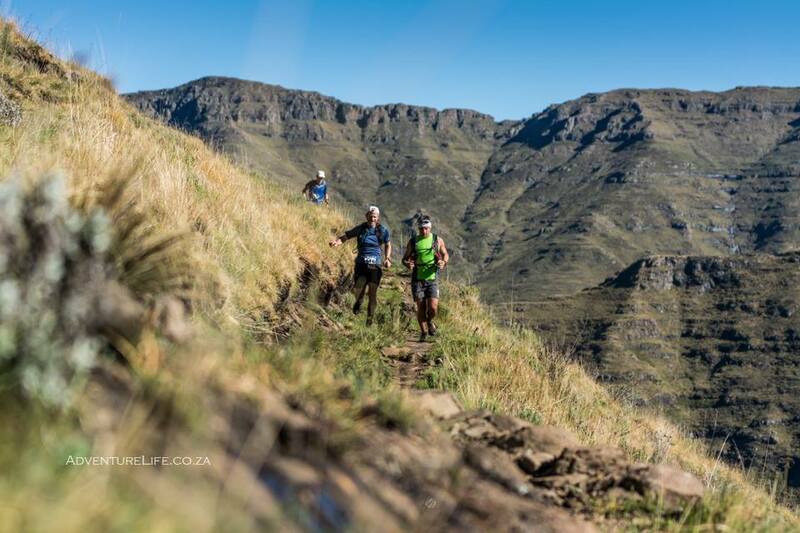 The epic 15 km downhill. I can’t describe how terrible the path was. There was nothing but relentless switch backs of rocks, boulders and what looks like a riverbed. Occasionally you would lose the path because of the intense concentration needed to avoid getting a tennis ball transplant in your ankle… A combination of this concentration and fatigue took its toll on me and I crawled into the 32km refuel point. A better sight I was sure I have never seen. The ladies at the point were incredibly helpful getting me everything I needed besides a new set of legs… my sugar was a little low too, so I promptly stoked up on jelly babies, potatoes and banana. It was clear that I needed to change my strategy here to one thing, survival. I spent too long at the refuel point, 30 minutes after the refuel I started to taste the high blood sugar in my mouth and my performance had deteriorated rapidly. A test confirmed, 16mmol/l – not ideal in the heat of the day at this stage of the race. The high sugar was dehydrating me in a stage of the race in which I was already struggling with hydration. In fear of losing my sense of humour, I took some Humalog (my insulin) and took a 15 min timeout before soldiering on. No one likes a moody, high sugar diabetic halfway up the toughest part of the route. This second climb is what makes this race what it is. It is a brutally honest climb that not once gives you the sense that you are nearing the top. It was hot and I was struggling with my blood sugar initially. Fortunately, you burn a lot of sugar up a climb like this and step by step I felt better and better. Nearing the top you could hear one awesome noisy marshal cheering for us up to the top. There is very little in the world that gets near to the joy you go through when you finally reach a much-needed refreshment point after 42km of the toughest trail possible. Being a race director myself, I had a good insight as to what was going through Andrew Booth’s (the race director) mind when he set this route. Quite frankly this last hill turned the event from an average day out into one that everyone will remember for the rest of their life! With only 6 km left of downhill you would think that it would be plain sailing, but that last 6km was the section in which I’d have to dig the deepest. Every joint and muscle in my legs and body were in agony. And downhills were far from being my friend on this event! The finish was surreal; some kind of end to the pain was a great welcome. Although, quite frankly, I was worried about being able to stand up after I sat down!… My finish line blood sugar level was a cool 5mmols. Happy! Now to smash some carbs if my body would let me eat anything before a solid 2 hr power nap. The venue for the event is second to none, coming into a 5-star mountain resort for the finish could not be more fitting. Maliba Mountain Lodge and staff pulled out all the stops to make a truly memorable experience. I finished in just over 10 hours in 75th place (there were 140 odd starters). The route can be described as nothing short of brutal! The event as a life-changing and truly spectacular experience I will never forget.